As a vegetarian, Nate Diaz (Pictured) has no need for meat in his diet. After beating bitter rival Donald Cerrone at UFC 141, Diaz claims his beef with the “Cowboy” is officially a thing of the past. 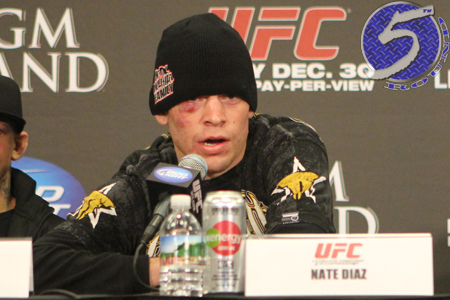 “It’s over now,” Diaz stated during the UFC 141 post-fight press conference. “We fought and we did what we had to do. There was a lot of hype behind the fight, mostly from the media trying to pump it as much as they can, and it was working. Prior to posting a unanimous decision victory on Friday, Diaz flipped off Cerrone’s cowboy hat and shoved him at the pre-event presser. He then followed it up by flipping the double-bird at Cerrone before the start of the 3rdRound. However, when it was all said and done, the lightweights put their feud to bed. Diaz even offered his former foe a parting gift to help mend fences. “He said, ‘Sorry for knocking your hat off, here’s mine,’” Cerrone said of Diaz handing him his beanie immediately after their scrap.